Members receive a DDA Membership Card, a Member Directory and Quarterly Newsletters. Included in the Newsletters are biographies of our members, tech-tips, industry information, updates on clinics and drum "happenings" and other words of inspiration. We also put together workshops and clinics that we hope will persuade drum manufacturers to work hand in hand with us in building adaptive equipment along with music stores and related organizations sponsoring DDA events. 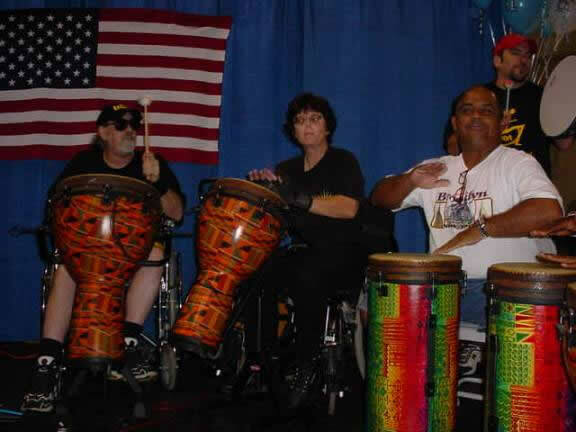 Annual membership donations of $20 cover the cost of printing newsletters and directories, postage and copying charges to get our members the latest news concerning the disabled drummer today. There is no age limit - the DDA is for all ages! We do require, however, that anyone under 18 have permission from a parent or guardian to join the DDA. Father Time, Pat Kennedy, Jeff Majewski and Juan Garcia enjoy the spotlight for the 25th Anniversary of the Disabilites Expo in Ft. Lauderdale, Florida, October 9th & 10th. Contact us with your news and we'll publish it!